Aim: The aim of this study is to describe treatment outcomes and complications of selective intra-arterial chemotherapy (IAC) for intraocular retinoblastoma (RB). Materials and Methods: A retrospective, interventional series of 10 eyes with RB which underwent IAC using melphalan (5 mg/7.5 mg) and topotecan (1 mg), or melphalan (5 mg/7.5 mg) alone. Treatment outcomes were evaluated in terms of tumor control, vitreous seeds (VS) and subretinal seeds (SRS) control, and globe salvage rates. Results: Ten eyes of 10 patients underwent 38 IAC sessions (mean = 3.8; median = 4; range = 3–5 sessions). Following IAC, complete regression of main tumor was seen in 9 eyes (90%) and partial regression in 1 (10%). All four eyes with SRS showed complete regression (100%). Of 5 eyes with VS, 3 eyes (60%) showed complete regression, 1 eye (20%) showed relapse, while 1 eye (20%) showed no response. Globe salvage was achieved in 8 of 10 eyes (80%). Complications included transient ophthalmic artery narrowing (n = 2), branched retinal vein occlusion (n = 1), forehead skin pigmentation (n = 1), and vitreous hemorrhage (n = 2). There was no case of stroke, hemiplegia, metastasis, or death. Transient hematological changes included relative pancytopenia (n = 4), relative leukopenia (n = 5), and relative thrombocytopenia (n = 4). Mean follow-up was 26 months (median = 28, range = 13–36) from the initiation of first IAC. Conclusions: IAC is an effective therapy for globe preservation in eyes with intraocular RB, in the setting of a developing country like India. Larger studies with longer follow-up are required to validate these results. Retinoblastoma (RB) is the most common intraocular tumor in pediatric age group. Management of subretinal seeds (SRS) or vitreous seeds (VS) in RB poses a therapeutic challenge with poor response to conventional systemic chemotherapy, often necessitating enucleation. Intra-arterial chemotherapy (IAC) was first introduced by Reese et al. in 1958, which involved direct delivery of chemotherapeutic agent into the carotid artery. The procedure was subsequently refined and modified by Kiribuchi, and Inomata and Kaneko., In its current form, as established by Abramson et al., IAC involves selective catheterization of ophthalmic artery under fluoroscopic guidance for targeted chemotherapeutic drug delivery to the affected eye. A recent report by Rishi et al. reported on the initial IAC results for RB in India. A Japanese study with 79 months follow-up showed the long-term outcomes following IAC. In this study, Suzuki et al. reviewed 408 eyes and reported long-term prognosis of IAC with globe salvage rate of 100% in Group A, 88% in Group B, 65% in Group C, 45% in Group D, and 30% in Group E. The cumulative incidence of secondary neoplasms was 1.3% at 5 years, 4.8% at 10 years, and 5.8% at 15 years. It is now clear that IAC is more effective when used as a primary therapy (72%–85%) than as a secondary (62%–72%) or salvage treatment., More recently, Say et al. evaluated the role of secondary and tertiary IAC in eyes with massive SRS and found SRS regression in 70% cases and globe salvage in 50% cases. Hereby, we present our 2-year results of IAC in eyes with RB among Indian partcipants. To the best of our knowledge, this is the first report of a 2-year follow-up for IAC-treated eyes with RB from India. In this retrospective, interventional case series, ten eyes of ten patients with RB treated with IAC at the Oncology Service between November 2013 and March 2016 were included. Prior Institutional Review Board approval was sought. All parents were provided written informed consent forms and consented after a detailed explanation of the risks and potential benefits of treatment. The study adhered to the tenets of the Declaration of Helsinki. The patient data were reviewed for presenting features, findings on clinical examination, management, complications, and outcomes. History of ocular and systemic treatments was recorded. A comprehensive ocular examination was performed under anesthesia with assessment for laterality, tumor growth pattern, number of tumors per eye, International Classification of RB (ICRB), Reese-Ellsworth classification, intraocular pressure (Schiotz tonometer), and associated features. Patients underwent magnetic resonance imaging scan every 6 months during treatment. Hematologic tests including complete blood counts and basic coagulation tests were done at baseline and repeated 2 weeks after every IAC. Each tumor was measured for greatest basal diameter and thickness (using ultrasonography), proximity to the optic nerve and foveola (mm), associated retinal detachment (0%–100%), SRS and VS. Intraoperative findings were documented with fundus drawing and fundus photography with RetCam camera (Massey Industries, Dublin, CA, USA). Treatment options and risks and benefits of IAC were discussed with the family, and a signed informed consent was obtained. Indications for IAC included participants with unilateral/bilateral Group B, C, or D, RB with/without previous systemic chemotherapy. The IAC catheterization procedure was performed by the interventional radiologist in the Cath lab. Intravenous heparin (75 IU/kg) was used for anticoagulation. The groin area was prepared, draped, and a 4-French arterial sheath was placed into the femoral artery region. Under fluoroscopic guidance, the French (1.3 mm diameter) catheter was guided into the ipsilateral internal carotid artery. Serial arteriograms helped visualize the eye and cerebral vasculature to allow the selection of the best approach to the ophthalmic artery from the internal carotid artery. The ipsilateral proximal portion of the ophthalmic artery was catheterized with a 450-μm microcatheter using fluoroscopy and road mapping, and a confirmatory angiogram was taken. Chemotherapeutic agents were diluted in 30 mL of saline and delivered using a pulsatile, nonlaminated technique over 30 min. to maximize homogeneous drug delivery. Chemotherapeutic agents used were melphalan (Alkacel, Celon Labs, India [5 mg/7.5 mg]) and topotecan (United Biotech [P] Ltd., India [1 mg]). The choice of drugs was influenced by patient's age, size of tumor, and presence of VS. In general, we plan 3 cycles of melphalan in all cases. A dose of 3 mg is considered for most tumors in Group B, C, or small D. A dose of 5 mg is used for most Group D and E eyes. A dose of 7.5 mg is used for persistent tumor activity following treatment with 5 mg melphalan. Topotecan (1 mg) is used in cases with extensive VS or in the eyes with lack of response to melphalan alone. 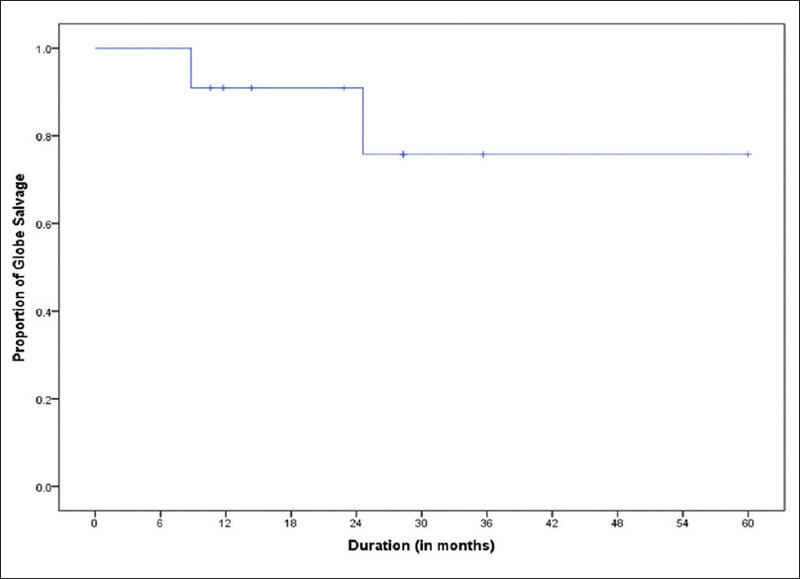 Patients were followed up at 1-monthly intervals, and IAC repeated as planned [Figure 1]. On follow-up visits, the fundus was evaluated for the status of the tumors, retina, retinal pigment epithelium, and optic nerve. New or preexisting neovascularization of the iris was recorded. Treatment outcomes were evaluated in terms of tumor control, VS and SRS control, and globe salvage rates. Treatment complications were noted. Patients were periodically evaluated by pediatric oncologist. The average age at treatment was 28 months (median = 26, range = 11–59 months). There were 8 male and 2 female patients. All 10 patients had nonfamilial RB. Patient demographics, disease characteristics at baseline, and prior treatment details are provided in [Table 1]. Patients presented with leukocoria (n = 5), strabismus (n = 1), both (n = 2), diminished vision (n = 1), or eye redness (n = 1). The average duration of symptoms at presentation was 10 weeks (median = 2, range = 0–48 weeks). Eyes with RB were classified according to the ICRB as Group B (n = 1), C (n = 2), D (n = 6), and E (n = 1). The mean tumor base was 16.5 mm (median = 17, range = 6–24 mm), and the mean tumor thickness was 6.8 mm (median = 8.1, range = 2.1–11.5 mm). VS were present in 8 eyes involving 2 quadrants (n = 4), 3 quadrants (n = 1), or all 4 quadrants (n = 3). SRS were present in 4 eyes involving 2 quadrants (n = 1), 3 quadrants (n = 1), or all 4 quadrants (n = 2). The optic nerve was visible in 3 eyes, partially visible in 3, and obscured by tumor overhang in 4 eyes. The secondary retinal detachment was present in 2 eyes (60%–100%). The number of tumors per eye ranged from 1 (n = 3), 2 (n = 4), 3 (n = 2), or 5 (n = 1). Mean proximity of tumor to optic disc was 1 mm (median = 0, range = 0–3 mm). Mean proximity of the tumor to foveola was 1 mm (median = 0, range = 0–6 mm). Six eyes (60%) had tumors that were predominantly endophytic while 4 eyes (40%) had predominantly exophytic tumors. IAC was employed as primary (n = 2) or secondary (n = 8) modality of systemic treatment. Eight of 10 patients had bilateral RB, of which fellow eye of 5 patients was enucleated for Group E tumor [Table 1]. Two patients received IAC as “primary” therapy; case 5, where fellow eye was enucleated for Group E tumor, and case 9, which had unilateral RB. Parents of case 5 insisted on IAC despite explaining the advantages of conventional intravenous chemotherapy with bilateral affection. Prior systemic treatment included intravenous chemotherapy with vincristine, etoposide and carboplatin (VEC) for 1 cycle (n = 1), 3 cycles (n = 2), 4 cycles (n = 1), 6 cycles (n = 2), 7 cycles (n = 1), or 11 cycles (n = 1). The mean number of prior systemic chemotherapy cycles was 5.1 in 8/10 eyes (that underwent secondary IAC). Local treatments included cryotherapy (n = 9), transpupillary thermotherapy (n = 5), and combination intravitreal chemotherapy with melphalan and topotecan (n = 1; case 9). 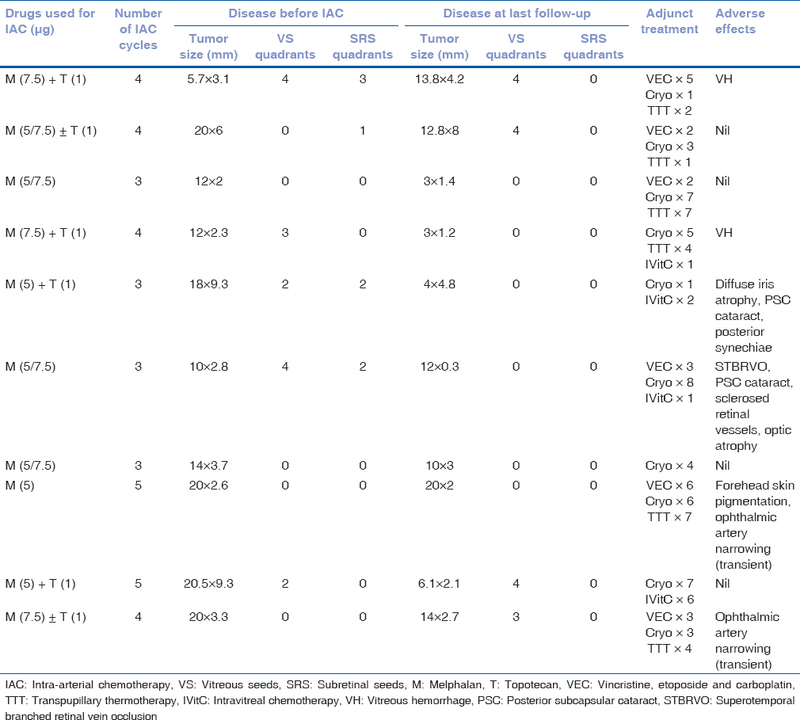 Tumor characteristics before IAC, treatment details, complications, and outcomes are mentioned in [Table 2]. Each eye received mean 3.8 IAC sessions per eye (median = 4; range = 3–5 sessions). Additional systemic chemotherapy included VEC for 2 cycles (n = 2), 3 cycles (n = 2), 5 cycles (n = 1), or 6 cycles (n = 1). Additional local therapy included cryotherapy (n = 10), transpupillary thermotherapy (n = 6), and combination intravitreal chemotherapy with melphalan and topotecan (n = 4). Following IAC, complete regression of the main tumor was seen in 9 eyes (90%) and partial regression was seen in 1 eye (10%). Of 8 eyes with VS at presentation, 6 received conventional IVC, of which 3 resolved. Five eyes had active VS before IAC, of which 2 eyes (40%) showed complete regression (case IV, VI), 2 eyes (40%) showed relapse (case V, IX), while 1 eye (20%) showed no response and eventually underwent enucleation (case I). Four of 8 eyes (with active VS at presentation) showed relapse of VS, following primary (2 of 2 eyes, 100%), or secondary IAC (2 of 6 eyes, 33.3%) during a mean follow-up of 26 months (range = 13–36). One of these four eyes underwent enucleation (case II), one eye showed complete regression (case V), and two eyes had persistence of VS at last follow-up (case IX, X). All eyes with SRS (n = 4) before IAC showed complete regression (100%) and remained regressed till the last follow-up. Globe salvage was achieved in 8 of 10 (80%) eyes, and 2 eyes underwent enucleation during treatment (case I and II); case I due to dense vitreous hemorrhage after fourth IAC session and case II due to the development of retinal detachment and recurrence of tumor. Histopathologic examination revealed poorly differentiated RB with choroidal invasion more than 3 mm in both the cases and involvement of postlaminar optic nerve and ciliary body infiltration in Case 2. Both cases underwent adjuvant chemotherapy using VEC for 5–6 cycles. The Kaplan–Meier analysis showed an event-free globe salvage rate of 70% at 5 years [Figure 2]. Complications included transient ophthalmic artery narrowing (n = 2; 18%), branch retinal vein occlusion (n = 1), sclerosed vessels (n = 1), posterior subcapsular cataract (n = 2), forehead skin pigmentation (n = 1), and vitreous hemorrhage (n = 2). There was no case of stroke, hemiplegia, metastasis, or death. Transient hematological changes included relative pancytopenia (n = 4), relative leukopenia (n = 5), and relative thrombocytopenia (n = 4). In our series of 10 cases, seven had advanced RB (Group D = 6, Group E = 1). The globe salvage rate of Group D tumors with IAC has been reported to be 45%–94%., We had a globe salvage rate of 80% in our series that is comparable to reported success rates. In our series, most (8 of 10) cases had IAC as a salvage treatment following failed conventional chemotherapy. Two eyes underwent enucleation, one on account of vitreous hemorrhage, and other in view of retinal detachment and tumor recurrence. Primary IAC has been observed to have far better outcomes in terms of globe salvage, tumor control, and functional outcomes as compared to secondary IAC., The two cases that had primary IAC for Group D RB had complete regression of the tumor with 3 and 5 cycles of IAC, respectively, but had recurrence of VS. This is an important factor determining the outcomes in such eyes. Abramson et al. reported better 2-year probability of ocular salvage with primary IAC (64%–83%) as compared to secondary IAC (50%–76%). The presence of VS at the time of initial failure of IAC, often require additional treatment with IAC or other methods after second-line IAC. The addition of intravitreal chemotherapy for VS control has been a path-breaking step forward. Complimentary use of IAC and intravitreal chemotherapy has shown good results.,,,, The management of RB currently involves a multipronged approach of using a combination of systemic intravenous chemotherapy and IAC along with adjunctive treatment in the form of intravitreal chemotherapy and focal treatment such as cryotherapy and transpupillary thermotherapy. We prefer to employ conventional intravenous chemotherapy as primary treatment in bilateral cases, with its inherent benefits of reduced second primary malignancies and reduced rates of pinealoblastoma. In case of intravenous chemotherapy failure, IAC is offered as a salvage therapy (secondary IAC). Affordability of treatment with IAC is another important factor limiting access to a large number of patients. This study has its own limitations, including the small cohort of 10 treated eyes and relatively short follow-up of median 25/27 months. In summary, we describe the outcomes of IAC for RB at 2 years from a single, tertiary eye-care center in India. Although data are limited to small number of eyes, the sustained effect of RB regression at mean 2 years follow-up is encouraging. Future efforts need to be focused on making this procedure more cost-effective and affordable. Reese AB, Hyman GA, Tapley ND, Forrest AW. The treatment of retinoblastoma by X-ray and triethylene melamine. AMA Arch Ophthalmol 1958;60:897-906. Kiribuchi M. Retrograde infusion of anti-cancer drugs to ophthalmic artery for intraocular malignant tumors. Nippon Ganka Gakkai Zasshi 1966;70:1829-33. Inomata M, Kaneko A. Chemosensitivity profiles of primary and cultured human retinoblastoma cells in a human tumor clonogenic assay. Jpn J Cancer Res 1987;78:858-68. Rishi P, Sharma T, Koundanya V, Bansal N, Saravanan M, Ravikumar R, et al. Intra-arterial chemotherapy for retinoblastoma:First Indian report. Indian J Ophthalmol 2015;63:331-4. Suzuki S, Yamane T, Mohri M, Kaneko A. Selective ophthalmic arterial injection therapy for intraocular retinoblastoma: The long-term prognosis. Ophthalmology 2011;118:2081-7. Abramson DH, Daniels AB, Francis JH, Brodie SE, Dunkel IJ, Marr BP, et al. Intra-arterial chemotherapy (ophthalmic artery chemosurgery) for group d retinoblastoma. PLoS One 2016;11:e0146582. Say EA, Iyer PG, Hasanreisoglu M, Lally SE, Jabbour P, Shields JA, et al. Secondary and tertiary intra-arterial chemotherapy for massive persistent or recurrent subretinal retinoblastoma seeds following previous chemotherapy exposure: Long-term tumor control and globe salvage in 30 eyes. J AAPOS 2016;20:337-42. Abramson DH, Marr BP, Dunkel IJ, Brodie S, Zabor EC, Driscoll SJ, et al. Intra-arterial chemotherapy for retinoblastoma in eyes with vitreous and/or subretinal seeding: 2-year results. Br J Ophthalmol 2012;96:499-502. Francis JH, Abramson DH, Gobin YP, Marr BP, Tendler I, Brodie SE, et al. Efficacy and toxicity of second-course ophthalmic artery chemosurgery for retinoblastoma. Ophthalmology 2015;122:1016-22. Munier FL, Gaillard MC, Balmer A, Soliman S, Podilsky G, Moulin AP, et al. Intravitreal chemotherapy for vitreous disease in retinoblastoma revisited: From prohibition to conditional indications. Br J Ophthalmol 2012;96:1078-83. Shields CL, Manjandavida FP, Arepalli S, Kaliki S, Lally SE, Shields JA. Intravitreal melphalan for persistent or recurrent retinoblastoma vitreous seeds: Preliminary results. JAMA Ophthalmol 2014;132:319-25. Shields CL, Douglass AM, Beggache M, Say EA, Shields JA. 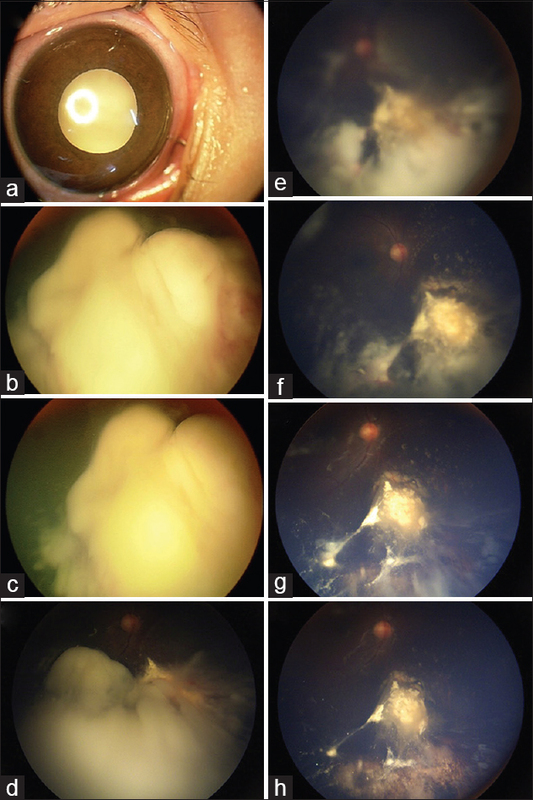 Intravitreous chemotherapy for active vitreous seeding from retinoblastoma: Outcomes after 192 consecutive injections. The 2015 Howard Naquin Lecture. Retina 2016;36:1184-90. Kaliki S, Shields CL. Retinoblastoma: Achieving new standards with methods of chemotherapy. Indian J Ophthalmol 2015;63:103-9.